CORVALLIS, Ore. – Reaching for a pesticide – even an organic one – should be a thoughtful act. Nothing used to kill pests is risk-free. Setting a threshold to decide when it’s time to act. Before using pesticides, identify your pest or disease. If you don’t know or can’t figure it out, capture the pest or take a large sample of the diseased plant to your local OSU Extension Master Gardeners. Prevention is key so monitor your garden closely for the first signs of a problem when it will be easier to control. Before you move up the IPM ladder, decide your threshold for damage in the garden. Leaving some of the bad bugs will attract the good ones that will kill them. If you decide the infestation is getting out of hand, don’t immediately get out the pesticides, Buhl said. Try biological controls like nematodes, lacewings or Bt (Bachillus thuringiensis) or physical methods like sticky traps, trap plants or a blast from a hose. Still not happy? Try a short-lived pesticide like neem oil or horticultural soap before moving up the IPM ladder. Just be aware, organic pesticides are often as toxic as synthetic ones. Nicotine, strychnine, and lead are all natural, but their impacts can be deadly. Sulfur can cause all sorts of problems from explosions when combined with products like nitrates and heavy metals to potential death if inhaled. Goggles and gloves are required for application of copper sulfate, which can be harmful to the skin and eyes. Even mint oil can be highly toxic to the eyes. Some organic pesticides low on the toxicity list include neem oil, pheromones, pyrethrins and most essential oils. Choose a product with instructions and precautions for pesticide use. Toxicity is not the only thing to consider, she said. Natural pesticides tend to break down faster than synthetic products, which persist longer in the environment. 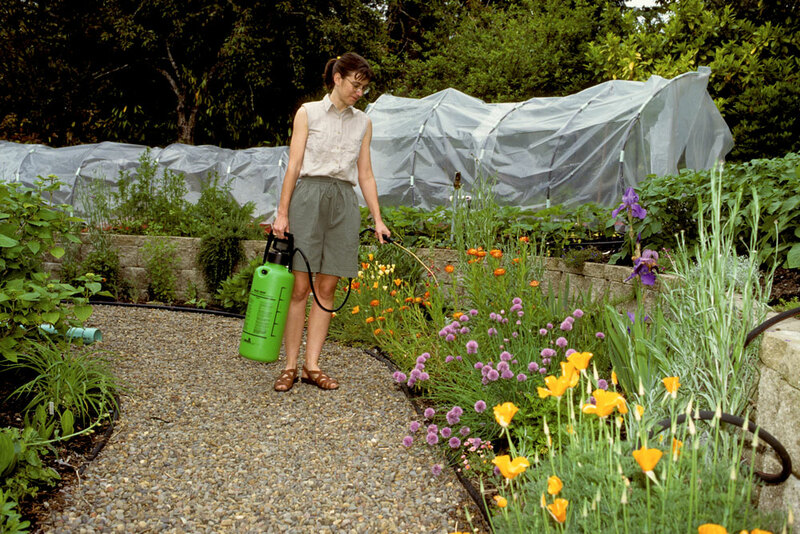 Biopesticides are more pest-specific so they’re less likely to kill non-target garden-dwellers, which will hang around to feed on the bad bugs. To determine a product’s toxicity, do some research, make use of the Master Gardeners or post clear photos of the entire plant and the damaged portion to Ask an Expert, an online service from OSU Extension. The label will also have the pertinent information, and it’s the law to follow it. When you decide you need an organic pesticide, look for the OMRI (Organic Materials Review Institute) stamp on the label. Based on the label requirements, you may still need to wear goggles, gloves and a face mask. Wearing safety equipment when you’re gardening may seem intrusive, but the alternative can be toxic. The label will also indicate for which pests and plants it’s appropriate. Buying a pesticide can seem daunting, but finding those that target your needs makes it simpler to choose. Be sure to mix it up sometimes because pests can build up resistance. But the bottom line, she reiterates is the use of IPM, which gives a complete toolbox of solutions.